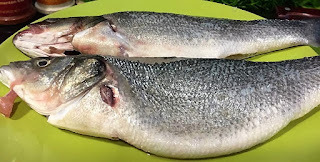 - Sea Bass is low in calories and an excellent source of protein, selenium and essential omega-3 fatty acids. But note that: Sea Bass contains mercury so pregnant women and children should limit the amount they eat. - Coriander powder aids digestion, has antibacterial properties, prevents anemia, treats conjunctivitis and prevents menstrual irregularities. It is also a cure for cold and flu and anti-diabetic. - Garlic is a remedy for ear infection, sore throat and tonsillitis. It wards off coughs and cold, breaks s down blood clots, reduces risk of heart attack and stroke, helps prevent cancer and aids respiratory problems. It also heal and reduce itchiness of insect bites, stop toothache and aids in digestion and stomach problems. - Tomatoes are anti-inflammatory. They reduce heart disease, lower risk of stone formation, lower cholesterol, reduce migraines and help prevent cancer. In addition, they purify blood, boost immunity, improve bones and promote healthy skin. - Capsicums are anti-inflammatory and anti-cancer. They are good for the eyes, burn calories, maintain a healthy heart, cure anemia, boost immune system, lower bad cholesterol, regulate blood pressure, and prevent hypertension. - Lemon helps with weight loss, improves digestion, relieves from constipation and promotes eye care. The benefits of lime also include treatment of scurvy, piles, peptic ulcer, respiratory disorders, gout, gums and urinary disorders. - Parsley is anti-inflammatory and rich in many vital vitamins, including Vitamin C, B 12, K and A. it helps keeps your immune system strong, tones your bones and heals the nervous system. In addition, parsley helps flush out excess fluid from the body, thus supporting kidney function. It also helps controlling blood pressure, maintaining healthy heart and preventing cancer. 2. In a cup, mix garlic, olive oil, salt, black pepper, coriander powder and the cumin powder. 3. Place fish in a baking dish. 6. Bake fish, uncovered, for 15 minutes; then sprinkle with parsley then continue to bake for 5 more minutes. 7. 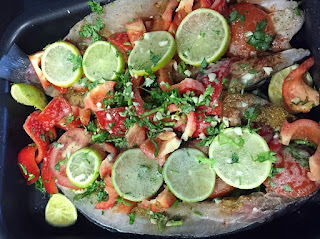 Drizzle remaining pan juices over fish and garnish with lemon slices.